Pot-au-feu is a stew made of less tender cuts of beef and pork. Here in the North Maine Woods the nights are getting chilly and the days are crisp and dry. It’s time to start thinking about fall and winter fair for the dinner table. 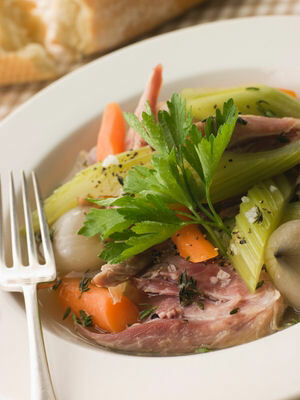 One of the family favorites is the French Canadian version of New England Boiled Dinner called Pot-Au-Feu. Pot au Feu translates to “pot on fire” and is a traditional rustic French stew that can be made with beef or pork. Traditionally in France it was considered “peasant fare” and was made with less expensive cuts of meat that required stewing for a long time. This is an old Maine dish that has its roots in the French Canadian culture that came to Maine when a lot of French Canadians from Quebec emigrated to the manufacturing plants in central Maine and to the logging camps of the North Maine Woods in the late 1800’s. There are large Franco-American populations in the cities of Lewiston, Augusta, and Waterville to this day. Maine cuisine is greatly influenced by these hard working people and their French culinary heritage. Spices – bouquet garni, salt, coarse ground black pepper, allspice and cloves. It’s an herb bouquet made of sprigs of thyme, parsley, bay leaves, and celery leaves tied together with a string and suspended in a soup or stew to give it more flavor. It is removed before serving. 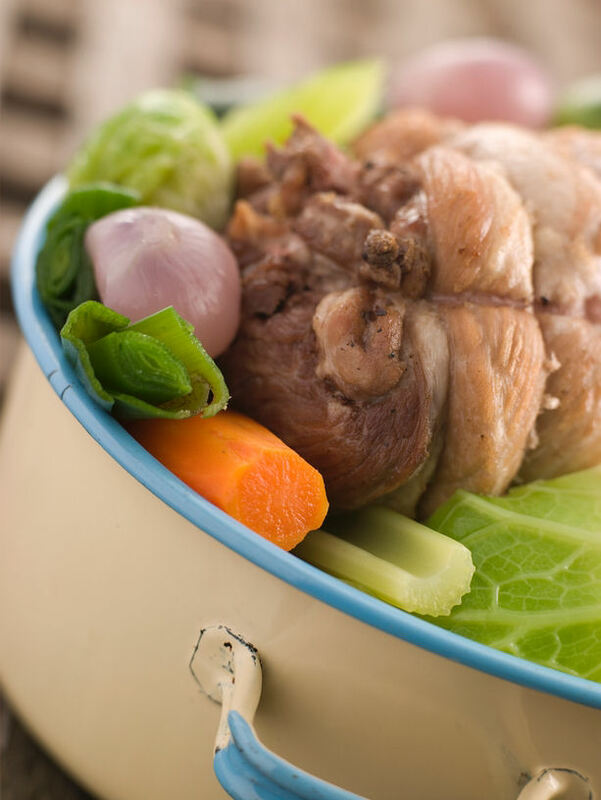 Served family style in a pot or individually in soup bowls, pot au feu is yummy with crusty bread, and cider vinegar and dijon mustard as condiments. A delicious meat stew with its roots in the Franco-American culture of Maine. 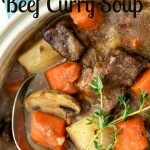 It uses less tender cuts of meat, and root vegetables so its perfect for a chilly fall or winter day. Put the meat in a large Dutch oven with the water and heat slowly. Allow the meat to boil gently and as a scum forms on the water, remove it. After skimming well, add all the spices and allow to boil slowly for 4 hours. Over medium heat add the vegetables, except potatoes. Cook for another 1/2 hour. Add potatoes and allow to cook over medium heat for 1/2 hour until all the vegetables are cooked and you can separate the meat with a fork. Serve family style in a large pot or individually in soup bowls with a nice crusty bread, and mustard and vinegar as condiments. This recipe looks delicious! Thanks for sharing it at the Pure Blog Love Linky Party. We’d love to see you at this weeks party as well! The party starts Thursday at 8 p.m. EST. I’m hosting at http://www.homemadefoodjunkie.com. Love to see you there! This sounds fantastic! I would love to have you link up with my Clever Chicks Blog Hop this week! Wow! This looks like the perfect fall comfort food 🙂 Thanks for sharing and linking up. 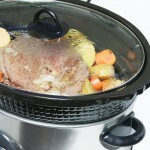 It is and try it in a slow cooker. It works well that way to! It is very similar… the difference is the seasoning and that New England Boiled Dinner is made with salty meats like ham, corned beef, etc. This looks delicious. I love recipes like this that cook in one pot. Easy cooking, serving and cleanup! Thanks for sharing on Tout It Tuesday. Hope to see you tomorrow. I can’t wait for more hearty dishes, love them for this time of year. But to cooking and it warming up the kitchen instead of blasting it. PS – following you on Linky. Tickled you shared you creative inspiration with Sunday’s Best – you helped make the party a success! Wow, this sounds wonderful, I love to cook and have never made this before. It’s perfect weather here in IL and been starting to make stews etc. It really does sound wonderful! My fingers are crossed you’ll share your creative inspiration tonight with Sunday’s Best http://www.my1929charmer.com – sharing is a good thing! Thank you and I’ll be sure to share it. Thank you for the invite! It’s not so much my inspiration as the tradition of the French Canadian culture here in Maine. They have so many wonderful, hearty dishes that I will be sharing on this blog so be sure to come back for more. Thanks for sharing this delicious recipe on Simple & Sweet Fridays. A perfect winter dish! Today it is in the low 60’s here in northern Maine, and you can see the first signs of the leaves changing color. It’s the kind of day that’s perfect for making a soup! 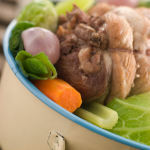 I just love your Pot Au Feu, it looks delicious and we will really enjoy this recipe. Hope you are having a great weekend and thank you so much for sharing with Full Plate Thursday. It’s a gorgeous weekend here in northern Maine. A few showers this morning but the sky is clearnow; the sun is bright; and we are seeing the first hint of color change in the leaves. Oh how I love fall! 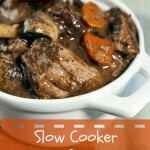 It does work well in the crock pot! This reminds me of the stews my mom made for us years ago. I can almost smell that aroma. I know what you mean about the aroma! When I’m cooking this the whole house smells so yummy! The combination of those seasonings are a gastronomic potpourri. Of course, that creates the problem of Bill pestering to have supper at 3:30 in the afternoon! Sounds good, and tastes even better!!!!!!!!!! This sounds like such a perfect, hearty winter meal! I would love to invite you to share this at Mom’s Test Meal Mondays! It is yummy! It’s a very satisfying meal for those crisp fall days when you have been working outside cleaning up the garden or stacking firewood for the season! Thanks so much for sharing this hearty dish at Must Try Monday! Thanks for stopping by and glad you enjoyed the recipe!